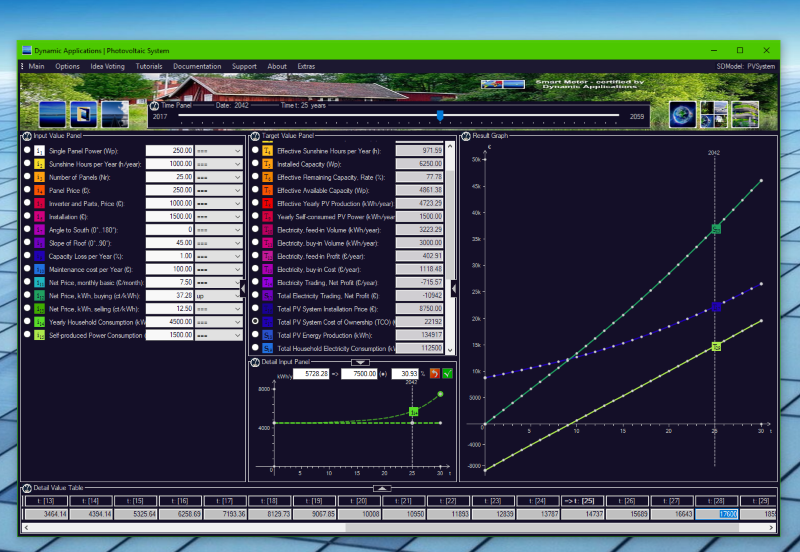 Simulate the amortization of a Photovoltaic System over 20..40 years, including Prosumer Electricity Network Trading. Fine-tune as many cost-driving, efficiency, and sales parameters as you want. See Total Cost of Ownership (TCO), Total Amortization, Relative Net Profit, and Return on Invest (RoI) Target Results over 30 years. PV System allows for a complete Return-on-Invest calculation, and allows to get a quick overview over any possible scenario options. Photovoltaic System is the first standalone application based on the Predicted Desire platform of free 21st century business case models. Through automated ToolTips, the whole calculation is Transparent and fully self-explanatory. We’re also protecting your privacy. No data gathering, no Server behind you. It’s your business. We respect that.